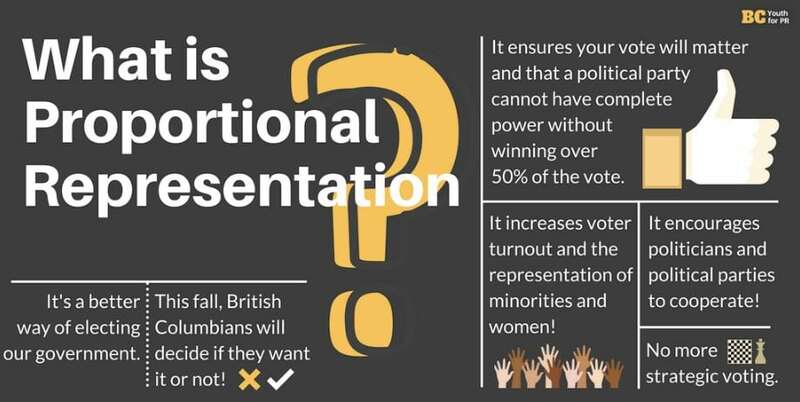 The following is a guest blog from Maria Dobrinskaya, who is spokeswoman for the Make Every Voter Count Society, the official proponent for the “Yes” side in B.C.’s upcoming referendum on Proportional Representation. Here at Sierra Club BC we are encouraging British Columbians to vote yes to ProRep for a whole host of reasons, including the fact that ProRep is good for the environment. We thank Maria for sharing her perspective with us. You can read our earlier blog posts on ProRep here and here. To find out more, visit voteprbc.ca. As the saying goes, the best defence is a strong offence. So it’s hardly surprising supporters of the status quo continue to spend most of their time attacking proportional representation. There’s very little to be proud of when it comes to defending BC’s first-past-the-post electoral system. There’s simply no way to sugar-coat it: BC’s first-past-the-post system is fundamentally unfair. On election night, the winning party almost always ends up with all the power after capturing less than half the vote. In fact, 17 of the last 18 BC elections using first-past-the-post have resulted in a party with less than 50 per cent of the vote holding a majority of the legislature’s seats. Effectively, our province is nearly always run by—and in the interests of—a minority of voters. Not surprisingly, a majority of British Columbians don’t feel their votes count for much. Their vote has little or no impact on the outcome of the election, and they have limited influence on their local MLA between elections. Taken together, this creates a toxic environment for our democracy. Just look at the experience that all too many have when they cast a ballot on election day. Many voters live in a constituency where, no matter what, the same party almost always wins. In these so-called safe seats, a vote for anyone else feels futile — even wasteful. Even for those voting for the leading party in a safe seat, it won’t really matter. The outcome is a foregone conclusion and their vote has no impact. In either scenario, voters have little incentive to head to the polls. But the wasted-vote problem doesn’t end there. Whole regions of our province today are filled with safe seats. And hundreds of thousands of citizens know their votes don’t matter. Most of the Island, Metro Vancouver, the northwest and the Kootenays elected NDP MLAs last May, leaving more than 200,000 BC Liberal voters in these regions without an MLA who reflects their values. The same can be said for more than 100,000 NDP voters in the Cariboo, Okanagan, the eastern Fraser Valley and most of the north. With proportional representation, all votes would count, no matter where you live. And election results under this more fair system would rebalance the political landscape across our province. The Island and Metro Vancouver would see more BC Liberal MLAs elected to the legislature. The Okanagan would send New Democrats to Victoria for the first time in many years. The Greens would finally secure seats on the mainland. And even the BC Conservatives, who are currently polling in the mid-teens in the Interior, would likely win seats there. Bottom line, voters in all regions of the province would elect MLAs from both the government and opposition parties. Safe seats also encourage MLAs to take local voters for granted. The nearly 60 MLAs in safe seats across BC worry little about winning re-election. Barring some freak event, they always do. Shielded from real competition and local accountability, these MLAs have little incentive to speak out about a local issue if it goes against the party line. After all, in our first-past-the-post system, MLAs’ primary loyalty is to their leader and party, especially for those serving in the governing caucus. Consider this: Out of more than 8,000 individual votes cast in our last legislature, only five went against party lines. So much for independent thinking. 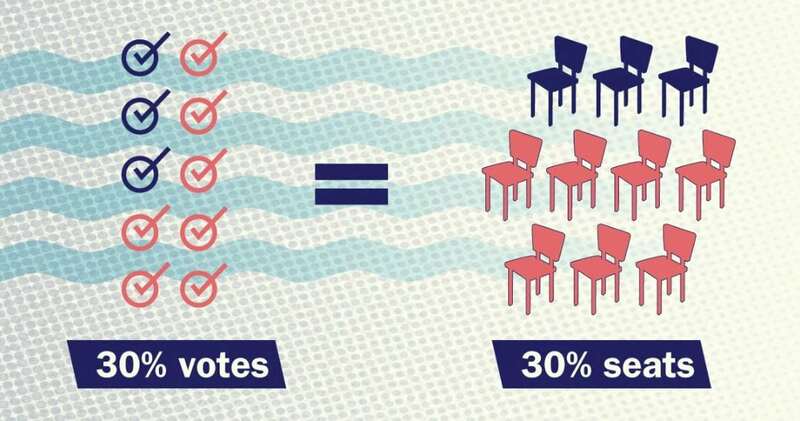 But with proportional voting, the number of safe seats would shrink significantly. Voters would have more power at the ballot box. And MLAs pried free of their safe seats could no longer take election day for granted. It also means, when choosing between speaking up for local concerns or following party orders, MLAs will feel motivated and supported by a proportional electoral system because it is highly responsive to voters. Yet as long as the first-past-the-post system remains in place, the majority of British Columbians’ votes won’t count. And that’s not only bad news for citizens, it also means that politics as usual will continue in Victoria. No wonder almost every other OECD country has ditched first past the post and embraced proportional representation. It’s time BC did the same. Maria Dobrinskaya is the spokeswoman for the Make Every Voter Count Society’s Vote PR B.C. campaign, BC director at the Broadbent Institute and the former co-chair of Vision Vancouver.